Woman to Woman: Who Are You? Identity; a word that so many of us wrestle with. A word that goes hand and hand with self image and self esteem. The dictionary defines "identity" as "being who or what a person or thing is." If I asked you to describe yourself to a stranger you may recount your physical description, your hobbies, what you like and dislike. But really, WHO ARE YOU? What do you believe about yourself? What makes you laugh? What breaks your heart? What are those deep longings in your soul? 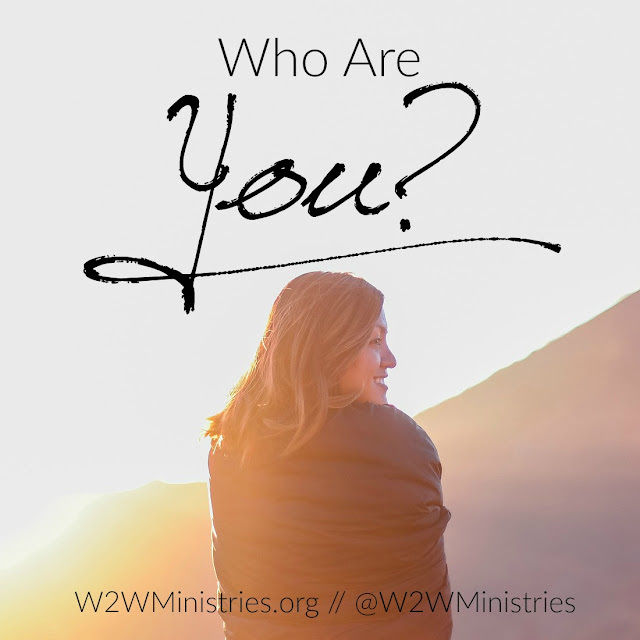 Where does your identity come from? What or who do you allow to define you? Is it the numbers on the scale? The opinions of others? Does your identity lie in your failure or success at your job? Do your critics define you, or the accolades and pats on the back? Does the media give or take away your worth when you meet or don't meet the expectations they set in regard to beauty and success? You see, for many years I succumbed to thinking I was only "good" if I looked, acted and sounded a certain way. I lost who I really was because I put so much effort into people pleasing that I forgot my identity. Maybe I never even really knew it. I let so many other people and things either put value on me or take it away that I was setting myself up for danger. Writing about this topic in NO way means that I am an expert. But I know what God has told me. Falling deeply in love with Jesus has changed everything about the way I see myself. Having an intimate relationship with my Savior, I now see a different me. I see a once very broken girl become a redeemed and restored treasure of Jesus. I see someone who had no hope, become someone who is certain I have a purpose. I see the me who strived so hard for perfection that it became detrimental to my well being, to someone who is now able to laugh at my mistakes. Please don't misunderstand my heart. I still have days when I am not impressed by my reflection, days when I am less than pleased with what I have thought or said. I know my life, my thoughts, my dreams, better than any earthly person. I know what goes through my head when I look in the mirror, I know what breaks my heart, I know what my deepest hidden dreams and desires are. I know the places I feel inadequate. I see the flaws that I want to improve. But I know what God says about me. He doesn't scream at me, "get it together for once, would ya?!" He doesn't bring up my past failures, He doesn't accuse. He doesn't love me for what I look like or don't look like. He simply loves me because that is who He is. HE IS LOVE. Do you know that He says good things about you? He tells you that you are redeemed, chosen, accepted, holy, forgiven, loved, His child, unique, fearfully & wonderfully made and the list could go on for days! Our identity should lie in what HE says. In what the Creator of the Universe thinks when He looks at you. He doesn't lie, He doesn't flatter, He doesn't stretch the truth. If He says it, He means it. When we get caught up in who we think we are supposed to be, we lose who we really are. When we become so consumed with letting other people define us, we lose who we really are. So what is your identity? Who does God say you are? Forget the labels the world gives. Forget who people tell you that you "should be." Walk in the confidence that you have a Savior who is crazy about you. Walk in the identity of Christ. When we really know who we are, when we really grasp our identity in Him; we walk victorious. Thank you for this! I needed this! !